A NASA space probe is nearing one of the solar’s system’s final frontiers after a 9-year journey. On July 14, … around noon, after a nine-year, 3 billion-mile journey, NASA’s 1,000-lb., grand-piano-size, $700 million New Horizons probe will streak past tiny Pluto at a blistering 31,000 m.p.h. The spacecraft is so remote now that radio communications–traveling at the speed of light–require a nearly nine-hour round-trip. Ultimately, New Horizons will come to within just 6,000 miles of the icy world, furiously snapping pictures and recording data on the temperature, structure and composition of Pluto, its five known moons and anything else that might be there–more moons, perhaps, or a system of rings. But it’s Pluto that’s the real prize. The little world has intrigued astronomers since it was first discovered more than 85 years ago. 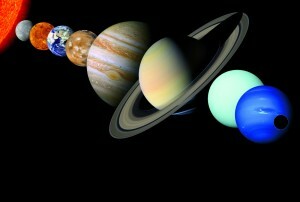 Until Pluto showed up, all the outer planets were known to be gas giants. What was this pip-squeak doing out there all alone? What was it made of? Why did it even exist? People just love Pluto. From the moment of its discovery in 1930 by Clyde Tombaugh, an Illinois farm boy who’d talked his way into a job at Arizona’s Lowell Observatory even though he’d never been to college, the tiny world fired the public imagination. At first, it was known simply as New Planet, but it was soon given its familiar name at the suggestion of an 11-year-old British girl named Venetia Burney, who thought the Roman god of the underworld nicely captured the feeling surrounding the dark and remote world. A few months later, Walt Disney capitalized on the public’s fascination by naming Mickey Mouse’s pet dog after the new planet. In 1955 the first Frisbee was marketed as the Pluto Platter. In the decades after Pluto’s discovery, better observations made it clear that the new world wasn’t anywhere near the size of the 7,926-mile-diameter Earth but just 1,471 miles across, or smaller than the moon. And starting in the ’90s, astronomers began to realize that Pluto isn’t alone at all. It’s merely the brightest member of an enormous swarm of ice-covered objects that make up what’s known as the Kuiper Belt, which orbits the sun out beyond Neptune. With the discovery of many more Kuiper Belt objects (KBOs), some rivaling Pluto in size, the IAU realized it was faced with the possibility of a solar system that could include dozens of planets. So the term planet, which had never been formally defined, was reframed in a way exquisitely tuned to exclude Pluto and its kin.